If you have a deep desire to help the overlooked people in society, an online master's degree in human services might be a great career choice for you. The field focuses on serving the underserved, from impoverished families and veterans to the elderly and those suffering from mental health or substance abuse issues. Human services positions are found in a variety of organizations, from nonprofits and government agencies to schools, churches, and medical facilities. A graduate degree ultimately gives students the tools they need to work effectively within these institutions and offer support to underserved populations through effective leadership, organizational management, and new social and health programs. An online master's in human services program is worth considering if you currently work in the field of human services and want to further your education or advance your career. Online programs allow you to continue working while managing the costs of your education. With average human services salaries lower than those of profit-driven employment sectors, affordability is most certainly a factor in your education decisions. Any degree program requires an investment of time and money, but rest assured there are affordable online master's in human services programs available. All distance education programs can help reduce ancillary costs such as commuting expenses, but not all schools can offer you a high-quality education and return on investment. It is not enough to simply consider the cheapest online master's in human services programs in terms of tuition because there's a difference between cheap colleges with poor programs and schools that provide a robust education at an affordable price. The colleges listed below are some of the best and most affordable online master's in human services programs in the country. They offer reasonable tuition and a variety of grants, scholarships and graduate assistantships to help students control costs. 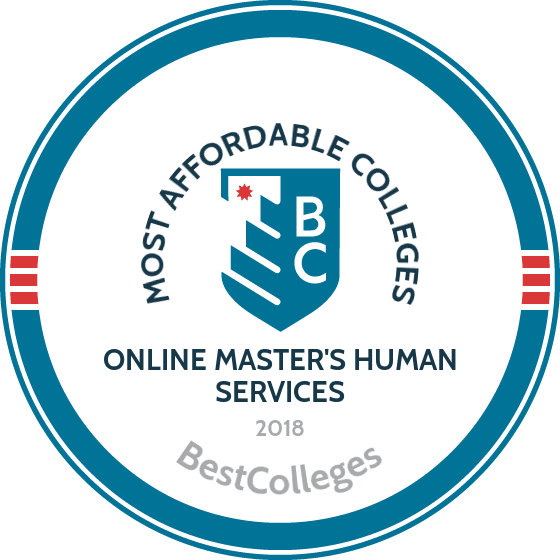 If you're considering going back to school for an online master's in human services, be sure to check out these top programs. Saint Joseph's online master's in human services emphasizes a leadership development curriculum for professionals. Students learn best practices to promote self-leadership while exploring the intricacies of organizational development within the field. The curriculum is based upon a competency application project, a self assessment that students take at the beginning of the program to determine their strengths. Students then develop a CAP for each of the program's 10 courses to cultivate their competencies in that specific subject. Courses include financing human services work, leadership dimensions of human behavior, and analyses in human services leadership. Graduates are poised to lead within the organizations and communities they serve. Admission requirements for the online master's in human services includes a 3.0 undergraduate GPA, two letters of recommendation, an interview, a written essay, and a current resume that reflects substantial work experience within the field. A maximum of six approved credits are transferable. Bellevue University's online master's in human services, designed for professionals in the field, includes courses in ethics, nonprofit administration, and career development. Over the course of the 36-credit program, students develop management skills and learn how to assess funding strategies, evaluate empirical reports, and analyze the role of community engagement. The required capstone project gives students the opportunity to apply counseling theories to real-world experiences. Courses include statistics and quantitative research, sustainable funding, writing on purpose, and nonprofit administration. The online program doesn't provide licensure to practice mental health counseling; it is intended for students seeking leadership roles. Bellevue's master's degree in human services online is an affordable choice. Admission requirements include six credits in behavioral science and a minimum 2.5 undergraduate GPA. Online students have access to university IT support seven days a week, and library resources are available 24/7. The University of Illinois Springfield's 44-credit master's degree in human services is comprised of 24 core courses and 20 concentration credits. Concentrations include alcoholism and substance abuse, child and family studies, gerontology, and social services administration. Self-inquiry motivates students to examine their own beliefs, values, and biases to effectively work with vulnerable populations. Students learn how to assess, advocate for, counsel, and manage clients. They also acquire the skills to successfully collaborate with individuals, groups, and agencies that most often need and use human services. Students must complete a comprehensive assessment case study analysis to the meet the requirements of the capstone project. It typically takes two years for full-time students to earn their online human services master's degree. Applicants must have successfully completed two undergraduate courses (six credits): one in statistics or research methods and the other in human behavior or life-span development. Additional admission requirements include a written statement of purpose, two letters of recommendation, and a formal interview. Students are not fully admitted until they achieve a grade of B or better in the first eight credit hours of coursework. Northeastern University's 45-credit master's in human services is comprised of 21 core credits, nine electives, and 16 concentration credits. Concentrations include leadership, organizational communication, and global studies. The curriculum includes courses in digital media, which explore the responsibilities, issues, and challenges posed by social media within the human services field. Program requirements include a capstone project and work-based applications. The field requirements are designed to integrate theory with real-world situations. Students pursuing an online master's in human services who choose the leadership concentration learn how to develop and manage teams and organizations. Students who choose the global studies concentration explore global literacy, culture, and community, and they study strategies that promote peace and help resolve conflicts. Admission requirements include a written statement of purpose, a professional resume, proof of English language proficiency, and two letters of recommendation. The university accepts no more than 12 approved transfer credits, which are granted on a case-by-case basis. The online master's in human services and leadership at Concordia University-Nebraska focuses on trends in the field, strategies for successful cross-cultural communication, and how to incorporate best practices and evidence-based procedures. The 36-credit online program is comprised of 12 courses; each lasts eight weeks. Most full-time students complete the program in two years. Core courses include topics in lifespan development, professional ethics, and volunteer management. The capstone project requires students to conduct programmatic research and implement learned applications to make a positive impact. For admittance into Concordia's master's degree in human services online, applicants must submit a 700-word essay explaining interest in the program and have relevant experience and career goals. Entrance exams, like the GMATs, are not required, but a single-page professional resume must be submitted. Transfer credits with a grade of B or higher may be approved with the supporting documentation. Students pursuing the 40-credit online master's of health and human services administration from Saint Mary's University of Minnesota learn effective leadership skills and the tenets of organizational management. The online master's in human services prepares students to implement fiscal and human resource management to maximize an organization's performance and quality of care. The program takes about two years to complete. Students must complete a capstone projects and practicum. The program provides practical learning experiences that complement academic training. Online students receive a university-issued iPad, loaded with a mobile learning platform. This enables easy course access and teaches the mobile tech skills demanded in today's job market. Saint Mary's admits students to its online master's in human services on a rolling basis. A maximum of six transfer credits may be accepted with prior approval. In addition to official transcripts, applicants are required to submit a personal essay, a professional resume, and two letters of recommendation. To earn a omaster's in human services administration at Wilmington University, students must complete a minimum of 33 credits, which includes six core courses, five electives, and a 120-hour guided practicum or capstone project. Leadership through film, one of the program electives, has students explore the nature of leadership as depicted in film. Other electives examine the challenges of grant-writing, volunteer management, and delivering care within faith-based organizations. Students with limited professional experience enroll in the practicum, which provides hands-on managerial training in a supervised learning environment. The capstone, intended for those with extensive workplace experience, requires students to design a program that meets a particular need and provides a benefit for their current workplace or agency of choice. Applicants to the university's online master's in human services must submit a two-page statement of purpose that includes career goals and reasons for choosing Wilmington. A maximum of six credits are transferable with the submission of official transcripts and a catalog course description. The 36-credit online master's in human services from the University of Northwestern-St. Paul is designed for learners who wish to learn through a Christian view. In addition to examining how faith and human services intersect, students learn how to design and evaluate human services programs to make a positive impact on clients, organizations, and communities. The program offers a concentration in family studies with courses in marriage and family dynamics, intervention strategies, parent education, and interviewing skills. Full-time students can complete the program in 18 months. Admission requirements include evidence of faith, a 500-word essay that addresses professional goals and spiritual commitment, and a minimum 2.8 undergraduate GPA. The tuition rate for the 2017-2018 academic year is $499 per credit. Lubbock's online master's in human services teaches students the skills to lead organizations, promote healthy families, and serve those in need. The 36-credit program, which can be completed in two years, offers two concentrations: nonprofit leadership and family life educator. The leadership concentration focuses on effectively managing and transforming organizations. The family life educator concentration prepares graduates for the rewarding work of rehabilitating broken or dysfunctional families. Both concentrations require students to earn 15-credits. The program does not offer licensure, but graduates who complete the family life educator coursework are prepared to pursue certified family life educator (CFLE) credentials. Core courses for the online master's in human services include crisis intervention, conflict resolution, and public policy. For the capstone requirement, students are tasked with designing and conducting a project that includes scholarly research and experiential application. Students also submit a professional APA-style paper and conduct an oral presentation on their findings. Lubbock's admission requirements include an undergraduate degree and a GPA of at least 3.0, two letters of recommendation, a resume, and a personal essay. A maximum of 12 transfer credits, with a grade of B or better, may be accepted upon approval. Southeastern University is affiliated with the Assemblies of God. The school offers an online master's in human services to students of all Christian backgrounds and affiliations. Courses in the 36-credit, non-clinical program last eight weeks, giving students the opportunity to complete their online human services master's degree in 12 months. The 24-credit core curriculum includes a practicum, which enables students to apply theory and skills while completing 350 hours of field experience within a human services agency. Students also study the integration of human services and theology, a course that explores contemporary evangelical efforts to combine both disciplines for a positive outcome. The curriculum includes five specializations: administrative, gerontology, children and family, emergency management, and ministry. Admission requirements to the master's degree in human services online include a minimum undergraduate GPA of 3.0, three references, a five page essay, GRE or GMAT scores, and a background check. Upon evaluation and approval, 25% of the total graduate credits may be accepted through transfer. Must offer a master's degree program in human services, 100% online.